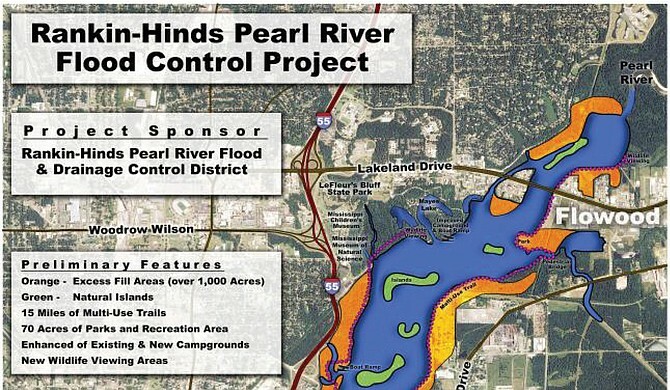 There is a pending permit application to the U.S. Army Corps of Engineers to dam the Pearl River and build a 1,500 acre lake in the Jackson, Mississippi metro-area. The proposed “One Lake” project is moving rapidly and begs for close scrutiny from all interests that rely on the Pearl River to safely and legally discharge their regulated wastewater. In Mississippi alone, 98 industries, businesses and municipalities have wastewater discharge permits affecting the Pearl River and its tributaries. Twenty municipal sewage plants depend on the Pearl River in Mississippi. Jackson, West Rankin, Picayune, Poplarville and Columbia are capable of a combined discharge of 92.5 million gallons per day of treated sewage. Terry, Byram, Mendenhall, New Hebron and Monticello, combined, can add another 1.5 million gallons per day. In Louisiana there are dozens of permit holders in Washington and St. Tammany Parishes, including Bogalusa International Paper mill, and the towns of Bogalusa, and Pearl River. They all need stable flows and adequate dilution on the Pearl and its tributaries. 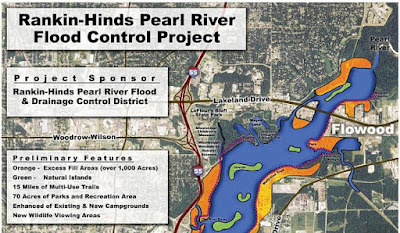 The Mississippi Department of Environmental Quality (MDEQ) issues permits requiring permit holders to treat their wastewater before releasing it into the Pearl or a tributary. Because there are other sources of wastewater going into the Pearl, like runoff from parking lots, farms and septic systems, the Pearl River is on the MDEQ Impaired Waters List. Too much nitrogen and phosphorus is ending up in the Pearl, so limits on the amount of these pollutants put into the Pearl have been written into permits held by industry, business and municipalities. Too much of nitrogen and phosphorus compounds cause excess algae and plankton to grow, and too much algae and plankton choke the life out of a river. Abundant algae and plankton growth, plus high summer temperatures rob the water of oxygen and can cause fish kills. Permit limits for nitrogen and phosphorus manage this risk to public health and the environment, but they also add costs to permit holders, which are passed on to customers and taxpayers. There must also be adequate water in a receiving stream to mix with and dilute the wastewater. Pollutant limits are important, but so is the flow of the river where the waste mixture is being released. Permit holders run into problems when stream flows are reduced and proper waste dilution isn’t possible. Reduced flows in our rivers happen each summer and fall when rainfall amounts are seasonally low. But there are other threats to flow, like the kind of dam being proposed for the Pearl. Dams threaten to limit flow, and limiting flow makes it tough to comply with wastewater discharge permits. The Pearl River is under such a threat now. On top of limiting flow with a dam, the surface area of an impounded lake evaporates much more water than the surface of a flowing river. More evaporation can affect flow and the dilution of pollutants. In 2013, the St. Tammany Parish engineering department examined evaporation predictions for this 1,500 acre lake project and calculated a possible reduction of 90 cubic feet per second of flow at their end of the Pearl River. That kind of reduction can have a significant impact on permits, and on the health of the river downstream. With water being evaporated now off of the Barnett Reservoir, and more evaporative loss from the surface of a second lake, the permit holders downstream should consider how a new lake will affect them. The “One Lake” sponsors claim that harmful changes to flow from a new lake and dam won’t hurt downstream interests on the Pearl. But once 1,500 acres are dredged, dammed and developed, it will be too late. The Drainage District sponsoring the project received permission from Congress to self-fund the required studies and environmental impact statements. This “self- funding” involved state money: the Mississippi Development Authority provided a $1 million Industry Incentive grant in 2013. Downstream permit holders must do their homework and closely examine the draft Environmental Impact Statement and feasibility studies that are expected to come out in the next few weeks. More changes in Pearl River flow will make complying with permit limits more difficult and more expensive. The Pearl River needs restoration, not more dams.